Musicians, singer-songwriters, vocalists of all ages! Here is the opportunity for emerging artists to gain experience performing on stage in front of an appreciative audience. The venue provides a sound engineer and professional sound system. A piano is available. 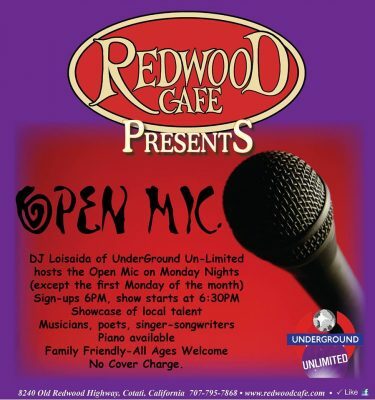 Open Mic at Redwood Cafe takes place every Monday except the first one of the month, from 6-9pm.